This article is about the empire founded by the Wanyan clan. For the empire founded by the Sima clan, see Jin dynasty (265–420). "Jurchen dynasty" redirects here. For the 17th-century Jurchen khanate, see Later Jin (1616–1636). "Anchu" redirects here. For the novel, see Anchu (novel). The Jin dynasty, officially known as the Great Jin (/dʒɪn/), lasted from 1115 to 1234 as one of the last dynasties in Chinese history to predate the Mongol invasion of China. Its name is sometimes written as Kin, Jurchen Jin or Jinn in English to differentiate it from an earlier Jìn dynasty of China whose name is identical when transcribed without tone marker diacritics in the Hanyu Pinyin system for Standard Chinese. It is also sometimes called the "Jurchen dynasty" or the "Jurchen Jin", because its founding leader Aguda (reign 1115–1123) was of Wanyan Jurchen descent. 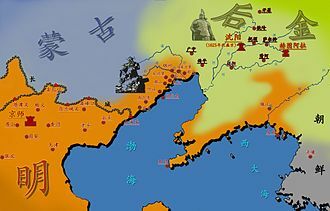 The Jin emerged from Taizu's rebellion against the Liao dynasty (907–1125), which held sway over northern China until the nascent Jin drove the Liao to the Western Regions, where they became known as the Western Liao. 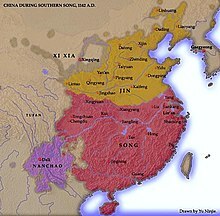 After vanquishing the Liao, the Jin launched an over hundred-year struggles against the Chinese Song dynasty (960–1279), which was based in southern China. Over the course of their rule, the Jurchens of Jin quickly adapted to Chinese customs, and even fortified the Great Wall against the rising Mongols. Domestically, the Jin oversaw a number of cultural advancements, such as the revival of Confucianism. The Mongols invaded the Jin under Genghis Khan in 1211 and inflicted catastrophic defeats on their armies. 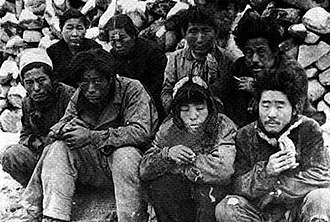 Though the Jin seemed to suffer a never-ending wave of defeats, revolts, defections, and coups, they proved to have tenacity. The Jin finally succumbed to Mongol conquest 23 years later in 1234. The Jin dynasty was officially known as the "Great Jin" at that time. 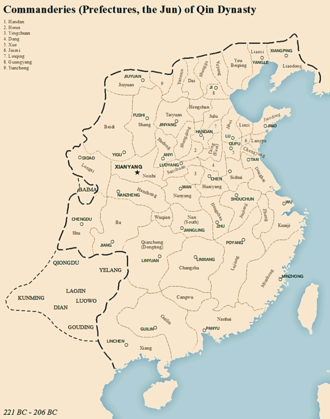 Furthermore, the Jin emperors referred to their state as Zhongguo (中國) like some other non-Han dynasties. Non-Han rulers expanded the definition of "China" to include non-Han peoples in addition to Han people whenever they ruled China. 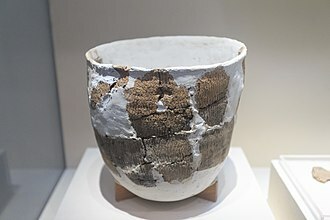 Jin documents indicate that the usage of "China" by dynasties to refer to themselves began earlier than previously thought. 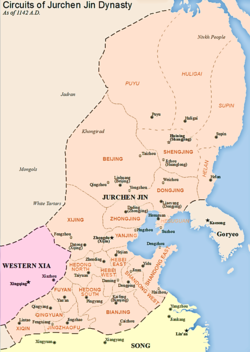 The Jin dynasty was created in modern Jilin and Heilongjiang by the Jurchen tribal chieftain Aguda in 1115. According to tradition, Aguda was a descendant of Hanpu. Aguda adopted the term for "gold" as the name of his state, itself a translation of "Anchuhu" River, which meant "golden" in Jurchen. This river known as Alachuke in Chinese, was a tributary of the Songhua River east of Harbin. The Jurchens' early rival was the Khitan-led Liao dynasty, which had held sway over modern north and northeast China and Mongolia, for several centuries. In 1121, the Jurchens entered into the Alliance Conducted at Sea with the Han Chinese-led Northern Song dynasty and agreed to jointly invade the Liao dynasty. While the Song armies faltered, the Jurchens succeeded in driving the Liao to Central Asia. In 1125, after the death of Aguda, the Jin dynasty broke its alliance with the Song dynasty and invaded north China. When the Song dynasty reclaimed the southern part of the Liao where Han Chinese lived, they were "fiercely resisted" by the Han Chinese population there who had previously been under Liao rule, while when the Jurchens invaded that area, the Han Chinese did not oppose them at all and handed over the Southern Capital (present-day Beijing, then known as Yanjing) to them. The Jurchens were supported by the anti-Song, Beijing-based noble Han clans. The Han Chinese who worked for the Liao were viewed as hostile enemies by the Song dynasty. Song Han Chinese also defected to the Jin. One crucial mistake that the Song made during this joint attack was the removal of the defensive forest it originally built along the Song-Liao border. Because of the removal of this landscape barrier, in 1126/27, the Jin army marched quickly across the North China Plain to Bianjing (present-day Kaifeng). On 9 January 1127, the Jurchens ransacked Kaifeng, the capital of the Northern Song dynasty, capturing both Emperor Qinzong and his father, Emperor Huizong, who had abdicated in panic in the face of the Jin invasion. Following the fall of Bianjing, the succeeding Southern Song dynasty continued to fight the Jin dynasty for over a decade, eventually signing the Treaty of Shaoxing in 1141, which called for the cession of all Song territories north of the Huai River to the Jin dynasty and the execution of Song general Yue Fei in return for peace. The peace treaty was formally ratified on 11 October 1142 when a Jin envoy visited the Song court. Having conquered Kaifeng and occupied North China, the Jin later deliberately chose earth as its dynastic element and yellow as its royal color. According to the theory of the Five Elements (wuxing), the earth element follows the fire, the dynastic element of the Song, in the sequence of elemental creation. Therefore, this ideological move shows that the Jin regarded the Song reign of China was officially over and themselves as the rightful ruler of China Proper. The Chengling Pagoda of Zhengding, Hebei Province, built between 1161 and 1189. After taking over Northern China, the Jin dynasty became increasingly sinicised. About three million people, half of them Jurchens, migrated south into northern China over two decades, and this minority governed about 30 million people. The Jurchens were given land grants and organised into hereditary military units: 300 households formed a moukecode: zho promoted to code: zh (company) and 7–10 moukescode: zho promoted to code: zh formed a meng-ancode: zho promoted to code: zh (battalion). Many married Han Chinese, although the ban on Jurchen nobles marrying Han Chinese was not lifted until 1191. After Emperor Taizong died in 1135, the next three Jin emperors were grandsons of Aguda by three different princes. 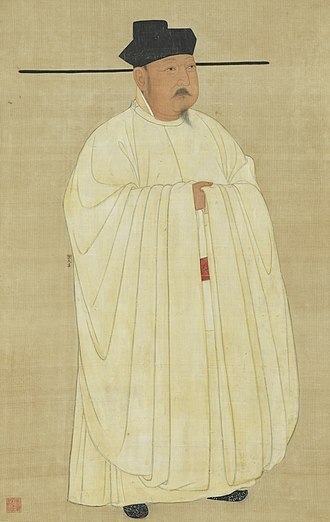 Emperor Xizong (r. 1135–1149) studied the classics and wrote Chinese poetry. He adopted Han Chinese cultural traditions, but the Jurchen nobles had the top positions. Later in life, Emperor Xizong became an alcoholic and executed many officials for criticising him. He also had Jurchen leaders who opposed him murdered, even those in the Wanyan clan. In 1149 he was murdered by a cabal of relatives and nobles, who made his cousin Wanyan Liang the next Jin emperor. Because of the brutality of both his domestic and foreign policy, Wanyan Liang was posthumously demoted from the position of emperor. Consequently, historians have commonly referred to him by the posthumous name "Prince of Hailing". Having usurped the throne, Wanyan Liang embarked on the program of legitimising his rule as an emperor of China. In 1153, he moved the empire's main capital from Huining Prefecture (south of present-day Harbin) to the former Liao capital, Yanjing (present-day Beijing). Four years later, in 1157, to emphasise the permanence of the move, he razed the nobles' residences in Huining Prefecture. Wanyan Liang also reconstructed the former Song capital, Bianjing (present-day Kaifeng), which had been sacked in 1127, making it the Jin's southern capital. Wanyan Liang also tried to suppress dissent by killing Jurchen nobles, executing 155 princes. To fulfil his dream of becoming the ruler of all China, Wanyan Liang attacked the Southern Song dynasty in 1161. Meanwhile, two simultaneous rebellions erupted in Shangjing, at the Jurchens' former power base: led by Wanyan Liang's cousin, soon-to-be crowned Wanyan Yong, and the other of Khitan tribesmen. 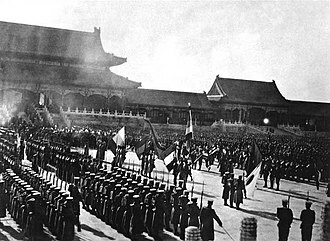 Wanyan Liang had to withdraw Jin troops from southern China to quell the uprisings. The Jin forces were defeated by Song forces in the Battle of Caishi and Battle of Tangdao. With a depleted military force, Wanyan Liang failed to make headway in his attempted invasion of the Southern Song dynasty. Finally he was assassinated by his own generals in December 1161, due to his defeats. His son and heir was also assassinated in the capital. Although crowned in October, Wanyan Yong (Emperor Shizong) was not officially recognised as emperor until the murder of Wanyan Liang's heir. The Khitan uprising was not suppressed until 1164; their horses were confiscated so that the rebels had to take up farming. Other Khitan and Xi cavalry units had been incorporated into the Jin army. Because these internal uprisings had severely weakened the Jin's capacity to confront the Southern Song militarily, the Jin court under Emperor Shizong began negotiating for peace. The Treaty of Longxing (隆興和議) was signed in 1164 and ushered in more than 40 years of peace between the two empires. In the early 1180s, Emperor Shizong instituted a restructuring of 200 meng'an units to remove tax abuses and help Jurchens. Communal farming was encouraged. The Jin Empire prospered and had a large surplus of grain in reserve. Although learned in Chinese classics, Emperor Shizong was also known as a promoter of Jurchen language and culture; during his reign, a number of Chinese classics were translated into Jurchen, the Imperial Jurchen Academy was founded, and the imperial examinations started to be offered in the Jurchen language. Emperor Shizong's reign (1161–1189) was remembered by the posterity as the time of comparative peace and prosperity, and the emperor himself was compared to the mythological rulers Yao and Shun. 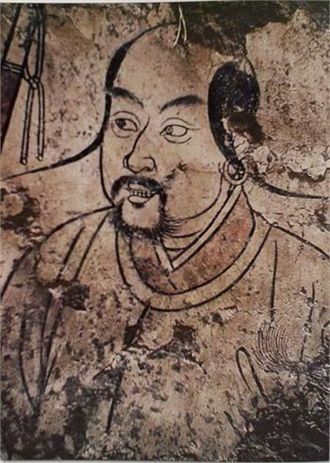 Emperor Shizong's grandson, Emperor Zhangzong (r. 1189–1208), venerated Jurchen values, but he also immersed himself in Han Chinese culture and married an ethnic Han Chinese woman. The Taihe Code of law was promulgated in 1201 and was based mostly on the Tang Code. In 1207, the Southern Song dynasty attempted an invasion, but the Jin forces effectively repulsed them. In the peace agreement, the Song dynasty had to pay higher annual indemnities and behead Han Tuozhou, the leader of the hawkish faction in the Song imperial court. Jade ornament with flower design, Jin dynasty, Shanghai Museum. Starting from the early 13th century, the Jin dynasty began to feel the pressure of Mongols from the north. Genghis Khan first led the Mongols into Western Xia territory in 1205 and ravaged it four years later. In 1211 about 50,000 Mongol horsemen invaded the Jin Empire and began absorbing Khitan and Jurchen rebels. The Jin had a large army with 150,000 cavalry but abandoned the "western capital" Datong (see also the Battle of Yehuling). The next year the Mongols went north and looted the Jin "eastern capital", and in 1213 they besieged the "central capital", Zhongdu (present-day Beijing). In 1214 the Jin made a humiliating treaty but retained the capital. That summer, Emperor Xuanzong abandoned the central capital and moved the government to the "southern capital" Kaifeng, making it the official seat of the Jin dynasty's power. In 1216, a hawkish faction in the Jin imperial court persuaded Emperor Xuanzong to attack the Song dynasty, but in 1219 they were defeated at the same place by the Yangtze River where Wanyan Liang had been defeated in 1161. The Jin dynasty now faced a two front war that they could not afford. Furthermore, Emperor Aizong won a succession struggle against his brother and then quickly ended the war and went back to the capital. He made peace with the Tanguts of Western Xia, who had been allied with the Mongols. Shi Tianze was a Han Chinese who lived under Jin rule. Inter-ethnic marriage between Han Chinese and Jurchens became common at this time. His father was Shi Bingzhi (史秉直). Shi Bingzhi married a Jurchen woman (surname Nahe) and a Han Chinese woman (surname Zhang); it is unknown which of them was Shi Tianze's mother. Shi Tianze was married to two Jurchen women, a Han Chinese woman, and a Korean woman, and his son Shi Gang was born to one of his Jurchen wives. His Jurchen wives' surnames were Monian and Nahe, his Korean wife's surname was Li, and his Han Chinese wife's surname was Shi. Shi Tianze defected to the Mongol forces upon their invasion of the Jin dynasty. His son, Shi Gang, married a Keraite woman; the Keraites were Mongolified Turkic people and considered as part of the "Mongol nation". Shi Tianze, Zhang Rou, Yan Shi and other Han Chinese who served in the Jin dynasty and defected to the Mongols helped build the structure for the administration of the new Mongol state. The Mongols created a "Han Army" (漢軍) out of defected Jin troops, and another army out of defected Song troops called the "Newly Submitted Army" (新附軍). 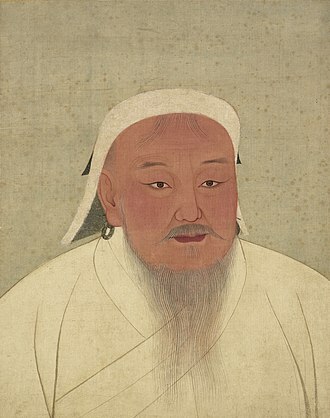 Genghis Khan died in 1227 while his armies were attacking Western Xia. His successor, Ögedei Khan, invaded the Jin dynasty again in 1232 with assistance from the Southern Song dynasty. The Jurchens tried to resist; but when the Mongols besieged Kaifeng in 1233, Emperor Aizong fled south to the city of Caizhou. A Song–Mongol allied army looted the capital, and the next year Emperor Aizong committed suicide to avoid being captured when the Mongols besieged Caizhou, ending the Jin dynasty in 1234. The territory of the Jin dynasty was to be divided between the Mongols and the Song dynasty. However, due to lingering territorial disputes, the Song dynasty and the Mongols eventually went to war with one another over these territories. In Empire of The Steppes, René Grousset reports that the Mongols were always amazed at the valour of the Jurchen warriors, who held out until seven years after the death of Genghis Khan. Contemporary Chinese writers ascribed Jurchen success in overwhelming the Liao and Northern Song dynasties mainly to their cavalry. Already during Aguda's rebellion against the Liao dynasty, all Jurchen fighters were mounted. It was said that the Jurchen cavalry tactics were a carryover from their hunting skills. Jurchen horsemen were provided with heavy armor; on occasions, they would use a team of horses attached to each other with chains (Guaizi Ma). 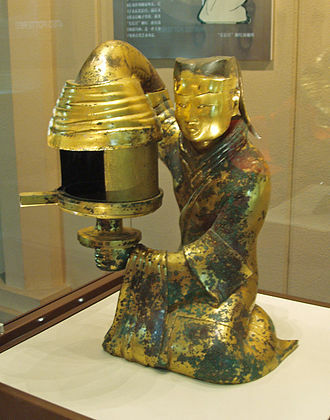 "Great Golden Central State O-Giao Jeo-Shio" (1196), found in now Mongolia. As the Liao dynasty fell apart and the Song dynasty retreated beyond the Yangtze, the army of the new Jin dynasty absorbed many soldiers who formerly fought for the Liao or Song dynasties. The new Jin empire adopted many of the Song military's weapons, including various machines for siege warfare and artillery. In fact, the Jin military's use of cannons, grenades, and even rockets to defend besieged Kaifeng against the Mongols in 1233 is considered the first ever battle in human history in which gunpowder was used effectively, even though it failed to prevent the eventual Jin defeat. On the other hand, the Jin military was not particularly good at naval warfare. Both in 1129–30 and in 1161 Jin forces were defeated by the Southern Song navies when trying to cross the Yangzi River into the core Southern Song territory (see Battle of Tangdao and Battle of Caishi), even though for the latter campaign the Jin had equipped a large navy of their own, using Han Chinese shipbuilders and even Han Chinese captains who had defected from the Southern Song. In 1130, the Jin army reached Hangzhou and Ningbo in southern China. But heavy Chinese resistance and the geography of the area halted the Jin advance, and they were forced to retreat and withdraw, and they had not been able to escape the Song navy when trying to return until they were directed by a Han Chinese defector who helped them escape in Zhenjiang. Southern China was then cleared of the Jurchen forces. In order to prevent incursion from the Mongols, a large construction program was launched. The records show that two important sections of the Great Wall were completed by the Jurchens. The Great Wall as constructed by the Jurchens differed from the previous dynasties. Known as the Border Fortress or the Boundary Ditch of the Jin, it was formed by digging ditches within which lengths of wall were built. In some places subsidiary walls and ditches were added for extra strength. The construction was started in about 1123 and completed by about 1198. The two sections attributable to the Jin dynasty are known as the Old Mingchang Walls and New Great Walls, together stretching more than 2,000 kilometres in length. The government of the Jin dynasty merged Jurchen customs with institutions adopted from the Liao and Song dynasties. The pre-dynastic Jurchen government was based on the quasi-egalitarian tribal council. Jurchen society at the time did not have a strong political hierarchy. The Shuo Fu (說郛) records that the Jurchen tribes were not ruled by central authority and locally elected their chieftains. Tribal customs were retained after Aguda united the Jurchen tribes and formed the Jin dynasty, coexisting alongside more centralised institutions. The Jin dynasty had five capitals, a practice they adopted from the Balhae and the Liao. The Jin had to overcome the difficulties of controlling a multi-cultural empire composed of territories once ruled by the Liao and Northern Song. The solution of the early Jin government was to establish separate government structures for different ethnic groups. Chinese gold plates and a chalice from the Jin Dynasty's Zhongdu. Because the Jin had few contacts with its southern neighbor the Song, different cultural developments took place in both states. Within Confucianism, the "Learning of the Way" that developed and became orthodox in Song did not take root in Jin. Jin scholars put more emphasis on the work of northern Song scholar and poet Su Shi (1037–1101) than on Zhu Xi's (1130–1200) scholarship, which constituted the foundation of the Learning of the Way. A significant branch of Taoism called the Quanzhen School was founded under the Jin by Wang Zhe (1113–1170), a Han Chinese man who founded formal congregations in 1167 and 1168. Wang took the nickname of Wang Chongyang (Wang "Double Yang") and the disciples he took were retrospectively known as the "seven patriarchs of Quanzhen". The flourishing of ci poetry that characterized Jin literature was tightly linked to Quanzhen, as two-thirds of the ci poetry written in Jin times was composed by Quanzhen Taoists. 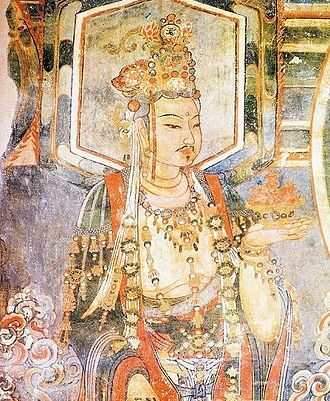 Jin dynasty fresco of a Bodhisattva from Chongfu Temple (崇福寺), Shuozhou, Shanxi. 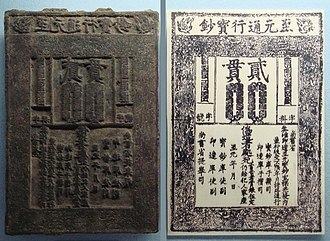 The Jin state sponsored an edition of the Taoist Canon that is known as the Precious Canon of the Mysterious Metropolis of the Great Jin (Da Jin Xuandu baozang 大金玄都寶藏). Based on a smaller version of the Canon printed by Emperor Huizong (r. 1100–1125) of the Song dynasty, it was completed in 1192 under the direction and support of Emperor Zhangzong (r. 1190–1208). In 1188, Zhangzong's grandfather and predecessor Shizong (r. 1161–1189) had ordered the woodblocks for the Song Canon transferred from Kaifeng (the former Northern Song capital that had now become the Jin "Southern Capital") to the Central Capital's "Abbey of Celestial Perpetuity" or Tianchang guan 天長觀, on the site of what is now the White Cloud Temple in Beijing. Other Daoist writings were also moved there from another abbey in the Central Capital. Zhangzong instructed the abbey's superintendent Sun Mingdao 孫明道 and two civil officials to prepare a complete Canon for printing. After sending people on a "nationwide search for scriptures" (which yielded 1,074 fascicles of text that was not included in the Huizong edition of the Canon) and securing donations for printing, in 1192 Sun Mingdao proceeded to cut the new woodblocks. The final print consisted of 6,455 fascicles. Though the Jin emperors occasionally offered copies of the Canon as gifts, not a single fragment of it has survived. A Buddhist Canon or "Tripitaka" was also produced in Shanxi, the same place where an enhanced version of the Jin-sponsored Taoist Canon would be reprinted in 1244. The project was initiated in 1139 by a Buddhist nun named Cui Fazhen, who swore (and allegedly "broke her arm to seal the oath") that she would raise the necessary funds to make a new official edition of the Canon printed by the Northern Song. Completed in 1173, the Jin Tripitaka counted about 7,000 fascicles, "a major achievement in the history of Buddhist private printing." It was further expanded during the Yuan. 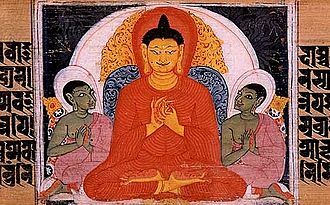 Buddhism thrived during the Jin, both in its relation with the imperial court and in society in general. Many sutras were also carved on stone tablets. The donors who funded such inscriptions included members of the Jin imperial family, high officials, common people, and Buddhist priests. 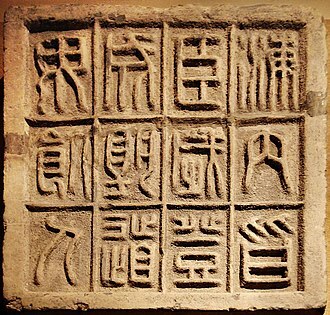 Some sutras have only survived from these carvings, which are thus highly valuable to the study of Chinese Buddhism. At the same time, the Jin court sold monk certificates for revenue. This practice was initiated in 1162 by Shizong to fund his wars, and stopped three years later when war was over. His successor Zhanzong used the same method to raise military funds in 1197 and one year later to raise money to fight famine in the Western Capital. The same practice was used again in 1207 (to fight the Song and more famine) as well as under the reigns of emperors Weishao (r. 1209–1213) and Xuanzong (r. 1213–1224) to fight the Mongols. (1) Too long. Normally not used when referring to this sovereign. (2) Too short. Easy to be ignored. ^ Turchin, Peter; Adams, Jonathan M.; Hall, Thomas D (December 2006). "East-West Orientation of Historical Empires" (PDF). Journal of World-systems Research. 12 (2): 219–229. doi:10.5195/JWSR.2006.369. ISSN 1076-156X. Archived from the original (PDF) on 22 February 2007. Retrieved 12 August 2010. ^ "Jin". Random House Webster's Unabridged Dictionary. ^ Lipschutz, Leonard (1 August 2000). Century-By-Century: A Summary of World History. iUniverse. p. 59. ISBN 9780595125784. Retrieved 28 June 2014. ^ Zhao 2006, p. 7. ^ Zhao 2006, p. 6. ^ Zhao 2006, p. 24. ^ Franke 1994, p. 221. ^ Denis C. Twitchett; Herbert Franke; John King Fairbank (25 November 1994). The Cambridge History of China: Volume 6, Alien Regimes and Border States, 907–1368. Cambridge University Press. p. 39. ISBN 978-0-521-24331-5. ^ Hoyt Cleveland Tillman; Stephen H. West (1995). China Under Jurchen Rule: Essays on Chin Intellectual and Cultural History. SUNY Press. pp. 28–. ISBN 978-0-7914-2273-1. ^ Elliott, Mark (2012). "8. Hushuo The Northern Other and the Naming of the Han Chinese" (PDF). In Mullaney, Tomhas S.; Leibold, James; Gros, Stéphane; Bussche, Eric Vanden. Critical Han Studies The History, Representation, and Identity of China's Majority. University of California Press. p. 186. ^ Jacques Gernet (31 May 1996). A History of Chinese Civilization. Cambridge University Press. pp. 358–. ISBN 978-0-521-49781-7. ^ Chen, Yuan Julian (2018). "FRONTIER, FORTIFICATION, AND FORESTATION: DEFENSIVE WOODLAND ON THE SONG–LIAO BORDER IN THE LONG ELEVENTH CENTURY". Journal of Chinese History. 2 (2): 313–334. doi:10.1017/jch.2018.7. ISSN 2059-1632. ^ Robert Hymes (2000). John Stewart Bowman, ed. Columbia Chronologies of Asian History and Culture. Columbia University Press. p. 34. ISBN 978-0-231-11004-4. ^ Chen, Yuan Julian. ""Legitimation Discourse and the Theory of the Five Elements in Imperial China." Journal of Song-Yuan Studies 44 (2014): 325–364". Journal of Song-Yuan Studies. ^ Mark C. Elliot (2001). The Manchu Way: The eight banners and ethnic identity in late imperial China. Stanford, California: Stanford University Press. p. 60. ^ a b Tao (1976), Chapter 6. "The Jurchen Movement for Revival", Pages 69–83. ^ Collectif (2002). Revue bibliographique de sinologie 2001. Éditions de l'École des hautes études en sciences sociales. p. 147. ^ May, Timothy Michael (2004). The Mechanics of Conquest and Governance: The Rise and Expansion of the Mongol Empire, 1185–1265. University of Wisconsin—Madison. p. 50. ^ Schram, Stuart Reynolds (1987). Foundations and Limits of State Power in China. European Science Foundation by School of Oriental and African Studies, University of London. p. 130. ^ Gary Seaman; Daniel Marks (1991). Rulers from the steppe: state formation on the Eurasian periphery. Ethnographics Press, Center for Visual Anthropology, University of Southern California. p. 175. ^ "404". Archived from the original on 2016-08-02. Retrieved 2016-05-03. ^ a b Igor de Rachewiltz, ed. (1993). In the Service of the Khan: Eminent Personalities of the Early Mongol-Yüan Period (1200–1300). Otto Harrassowitz Verlag. p. 41. ^ a b J. Ganim; S. Legassie, eds. (2013). 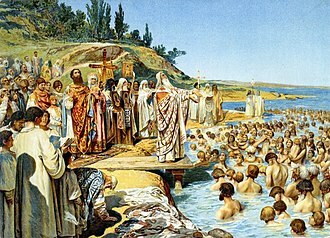 Cosmopolitanism and the Middle Ages. Springer. p. 47. ^ Watt, James C. Y. (2010). The World of Khubilai Khan: Chinese Art in the Yuan Dynasty. Metropolitan Museum of Art. p. 14. ^ Chan, Hok-Lam (1997). "A Recipe to Qubilai Qa'an on Governance: The Case of Chang Te-hui and Li Chih". Journal of the Royal Asiatic Society. Cambridge University Press. 7 (2): 257–83. doi:10.1017/S1356186300008877. ^ Hucker, Charles O. (1985). A Dictionary of Official Titles in Imperial China. Stanford University Press. p. 66. ^ a b c d e Tao (1976), Chapter 2. "The Rise of the Chin dynasty", Pages 21–24. ^ René Grousset (1970). The Empire of the Steppes: A History of Central Asia (reprint, illustrated ed.). Rutgers University Press. p. 137. ISBN 978-0-8135-1304-1. The emperor Kao-tsung had taken flight to Ningpo (then known as Mingchow) and later to the port of Wenchow, south of Chekiang. From Nanking the Kin general Wu-chu hastened in pursuit and captured Hangchow and Ningpo (end of 1129 and beginning of 1130. However, the Kin army, consisting entirely of cavalry, had ventured too far into this China of the south with its flooded lands, intersecting rivers, paddy fields and canals, and dense population which harassed and encircled it. We-chu, leader of the Kin troops, sought to return north but was halted by the Yangtze, now wide as a sea and patrolled by Chinese flotillas. At last a traitor showed him how he might cross the river near Chenkiang, east of Nanking (1130). ^ Jacques Gernet (1996). A history of Chinese civilization (2, illustrated, revised ed.). Cambridge University Press. p. 357. ISBN 978-0-521-49781-7. Nanking and Hangchow were taken by assault in 1129 and in 1130 the Jürchen ventured as far as Ning-po, in the north-eastern tip of Chekiang. ^ "Great Wall of Jin Dynasty (1115 - 1234): History, Structure, Relics". ^ a b Franke 1994, p. 265. ^ Franke 1994, pp. 265–266. ^ Franke 1994, p. 266. ^ Franke 1994, p. 270. ^ Franke 1994, p. 267. ^ Tillman 1995, pp. 71–114. ^ a b c d Boltz 2008, p. 291. ^ Boltz 2008, pp. 291–92. ^ a b Boltz 2008, p. 292. ^ Yao 1995, p. 174; Goossaert 2008, p. 916 (both Buddhist Canon and Daoist Canon printed in Shanxi). ^ a b c Yao 1995, p. 174. ^ Yao 1995, p. 173. ^ a b c Yao 1995. ^ a b Yao 1995, p. 161. ^ Yao 1995, pp. 161–62. Boltz, Judith (2008), "Da Jin Xuandu baozang 大金玄嘟寶藏", in Pregadio, Fabrizio, The Encyclopedia of Taoism, London and New York: Routledge, pp. 291–92, ISBN 978-0-7007-1200-7 . Chen Yuan (2014), "Legitimation Discourse and the Theory of the Five Elements in Imperial China," Journal of Song-Yuan Studies 44(1): 325–364. DOI: 10.1353/sys.2014.0000. Franke, Herbert (1971), "Chin Dynastic History Project", Sung Studies Newsletter, 3 (3): 36–37, JSTOR 23497078, (Subscription required (help)) . Goossaert, Vincent (2008), "Song Defang 宋德方", in Pregadio, Fabrizio, The Encyclopedia of Taoism, London and New York: Routledge, pp. 915–16, ISBN 978-0-7007-1200-7 . The Qara Khitai, known as the Kara Khitan Khanate or Western Liao, officially the Great Liao, was a sinicized Khitan empire in Central Asia. The empire was usurped by the Naimans under Kuchlug in 1211, traditional Chinese, the empire was conquered by the Mongol Empire in 1218. Kara Khitan was the used by the Khitans to refer to themselves. The phrase is translated as the Black Khitans in Turkish. In Mongolian, Kara-Khitan is rendered Хар Хятан, since no direct records from the empire survive today, the only surviving historical records about the empire come from outside sources. Black Khitans has seen used in Chinese. The Jurchens referred to the empire as Dashi or Dashi Linya, Muslim historians initially referred to the state simply as Khitay or Khitai, they may have adopted this form of Khitan via the Uyghurs of Kocho in whose language the final -n or -ń became -y. Only after the Mongol conquest did the state begin to be referred to in the Muslim world as the Kara-Khitai or Qara-Khitai, the Qara Khitai empire was established by Yelü Dashi, who led nomadic Khitans west by way of Mongolia after the collapse of the Liao dynasty. The Jurchens, once vassals of the Khitans, had allied with the Song dynasty, Yelü recruited Khitans and other tribes to form an army, and in 1134 captured Balasagun from the Kara-Khanid Khanate, which marks the start of the empire in Central Asia. The Khitan forces were joined by 10,000 Khitans. The Khitans conquered Kashgar and Beshbalik, the Khitans defeated the Western Kara-Khanid Khanate at Khujand in 1137, eventually leading to their control over the Fergana Valley. They won the Battle of Qatwan against the Western Kara-Khanids and the Seljuk Empire on September 9,1141, Yelü Dashi died in 1143, and his wife, Xiao Tabuyan, acted as regent for their son. Their son, Yelü Yiliu, became the ruler in 1150 and died in 1163, to be succeeded by his sister and she sent her husband, Xiao Duolubu, on many military campaigns. She fell in love with his brother, Xiao Fuguzhi. They were executed in 1177 by her father-in-law, Xiao Wolila, the empire was weakened by rebellions and internal wars among its vassals, especially during the latter parts of its history. Cash was a type of coin of China and East Asia from the 2nd century BC until the 20th century AD. The English term cash referring to the coin was derived from the Tamil kāsu, the English word cash, meaning tangible currency, is an older and unrelated word from Middle French caisse. There are a variety of Chinese terms for cash coins, usually descriptive, Chinese qián is a weight-derived currency denomination in Chinese called mace in English. 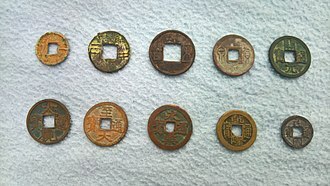 Traditionally, Chinese cash coins were cast in copper, brass or iron, in the mid-19th century, the coins were made of 3 parts copper and 2 parts lead. Cast silver coins were produced but are considerably rarer. Cast gold coins are known to exist but are extremely rare. Chinese cash coins originated from the barter of farming tools and agricultural surpluses, around 1200 BC, smaller token spades and knives began to be used to conduct smaller exchanges with the tokens melted down to produce real farm implements. These tokens came to be used as media of exchange themselves and were known as spade money, the hole enabled the coins to be strung together to create higher denominations, as was frequently done due to the coins low value. The number of coins in a string of cash varied over time, a string of 1000 cash was supposed to be equal in value to one tael of pure silver. A string of cash was divided into ten sections of 100 cash each, local custom allowed the person who put the string together to take a cash or a few from each hundred for his effort. Thus an ounce of silver could exchange for 970 in one city and 990 in the next, in some places in the North of China short of currency the custom counted one cash as two and fewer than 500 cash would be exchanged for an ounce of silver. A string of cash weighed over ten pounds and was carried over the shoulder. 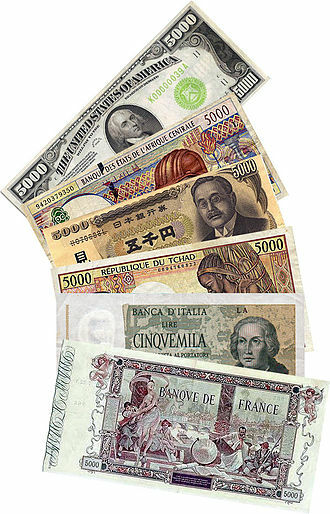 Paper money equivalents known as flying cash sometimes showed pictures of the number of cash coins strung together. The Koreans and Vietnamese all cast their own copper cash in the part of the second millennium similar to those used by China. The last Chinese cash coins were struck, not cast, in the reign of the Qing Xuantong Emperor shortly before the fall of the Empire in 1911, the coin continued to be used unofficially in China until the mid-20th century. Confucianism, known as Ruism, is described as tradition, a philosophy, a religion, a humanistic or rationalistic religion, a way of governing, or simply a way of life. In the Han dynasty, Confucian approaches edged out the proto-Taoist Huang-Lao, the disintegration of the Han political order in the second century CE opened the way for the doctrines of Buddhism and Neo-Taoism, which offered spiritual explanations lacking in Confucianism. A Confucian revival began during the Tang dynasty of 618-907, in the late Tang, Confucianism developed in response to Buddhism and Taoism and was reformulated as Neo-Confucianism. This reinvigorated form was adopted as the basis of the imperial exams, the abolition of the examination system in 1905 marked the end of official Confucianism. The New Culture intellectuals of the twentieth century blamed Confucianism for Chinas weaknesses. In the late twentieth century Confucian work ethic has been credited with the rise of the East Asian economy, with particular emphasis on the importance of the family and social harmony, rather than on an otherworldly source of spiritual values, the core of Confucianism is humanistic. While Tiān has some characteristics that overlap the category of deity, it is primarily an impersonal absolute principle, Confucianism focuses on the practical order that is given by a this-worldly awareness of the Tiān. Confucian thought focuses on the cultivation of virtue and maintenance of ethics, Some of the basic Confucian ethical concepts and practices include rén, yì, and lǐ, and zhì. Rén is the essence of the human being which manifests as compassion and it is the virtue-form of Heaven. Yì is the upholding of righteousness and the disposition to do good. Lǐ is a system of norms and propriety that determines how a person should properly act in everyday life according to the law of Heaven. Zhì is the ability to see what is right and fair, or the converse, Confucianism holds one in contempt, either passively or actively, for failure to uphold the cardinal moral values of rén and yì. In the 20th century Confucianisms influence diminished greatly, in the last decades there have been talks of a Confucian Revival in the academic and the scholarly community and there has been a grassroots proliferation of various types of Confucian churches. Taoism, known as Daoism, is a religious or philosophical tradition of Chinese origin which emphasizes living in harmony with the Tao. The Tao is an idea in most Chinese philosophical schools, in Taoism, however. Taoism differs from Confucianism by not emphasizing rigid rituals and social order, the Tao Te Ching, a compact book containing teachings attributed to Laozi, is widely considered the keystone work of the Taoist tradition, together with the writings of Zhuangzi. By the Han dynasty, the sources of Taoism had coalesced into a coherent tradition of religious organizations. In earlier ancient China, Taoists were thought of as hermits or recluses who did not participate in political life, Zhuangzi was the best known of these, and it is significant that he lived in the south, where he was part of local Chinese shamanic traditions. Women shamans played an important role in this tradition, which was strong in the southern state of Chu. Early Taoist movements developed their own institution in contrast to shamanism, shamans revealed basic texts of Taoism from early times down to at least the 20th century. Institutional orders of Taoism evolved in various strains that in recent times are conventionally grouped into two main branches, Quanzhen Taoism and Zhengyi Taoism. After Laozi and Zhuangzi, the literature of Taoism grew steadily and was compiled in form of a canon—the Daozang—which was published at the behest of the emperor, throughout Chinese history, Taoism was nominated several times as a state religion. After the 17th century, however, it fell from favor, Chinese alchemy, Chinese astrology, Chan Buddhism, several martial arts, traditional Chinese medicine, feng shui, and many styles of qigong have been intertwined with Taoism throughout history. Beyond China, Taoism had influence on surrounding societies in Asia, Taoism has a presence in Hong Kong, and in Southeast Asia. English speakers continue to debate the preferred romanization of the words Daoism and Taoism, the root Chinese word 道 way, path is romanized tao in the older Wade–Giles system and dào in the modern Pinyin system. In linguistic terminology, English Taoism/Daoism is formed from the Chinese loanword tao/dao 道 way, route and the native suffix -ism. Huining Prefecture was a prefecture in the Shangjing region of Manchuria. It served as the first superior capital of the Jurchen-led Jin dynasty from 1122 to 1153 and its location was in present-day Acheng District, Harbin City, Heilongjiang Province, China. During the early years of building up their empire, Jurchen rulers often moved people from elsewhere in China to their capital, the first emperor of the Jurchen-led Jin dynasty, Aguda resettled captives to the Shangjing area during his war against the Khitan-led Liao dynasty. Agudas successor, Wuqimai conquered most of northern China in the wars against the Han Chinese-led Northern Song dynasty and he continued the policy, resulting in numerous wealthy people, skilled craftsmen from Yanjing and the former Song capital, being relocated to Shangjing. 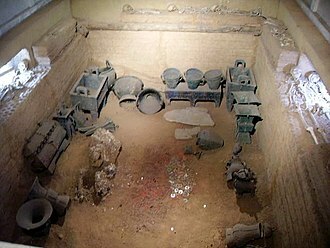 A variety of valuable goods captured in Bianjing was brought to the Jin capital as well, the city plan on Shangjing emulated major Chinese cities, in particular Bianjing, although the Jin capital was much smaller than its Northern Song prototype. The Han dynasty was the second imperial dynasty of China, preceded by the Qin dynasty and succeeded by the Three Kingdoms period. Spanning over four centuries, the Han period is considered an age in Chinese history. To this day, Chinas majority ethnic group refers to itself as the Han people and it was founded by the rebel leader Liu Bang, known posthumously as Emperor Gaozu of Han, and briefly interrupted by the Xin dynasty of the former regent Wang Mang. This interregnum separates the Han dynasty into two periods, the Western Han or Former Han and the Eastern Han or Later Han, the emperor was at the pinnacle of Han society. He presided over the Han government but shared power with both the nobility and appointed ministers who came largely from the gentry class. The Han Empire was divided into areas controlled by the central government using an innovation inherited from the Qin known as commanderies. 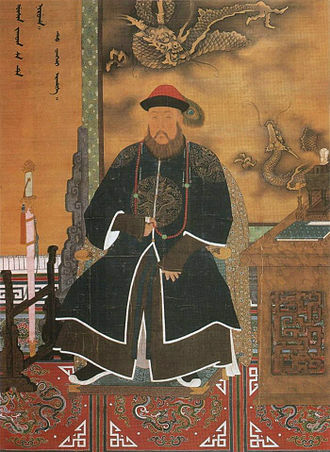 These kingdoms gradually lost all vestiges of their independence, particularly following the Rebellion of the Seven States, from the reign of Emperor Wu onward, the Chinese court officially sponsored Confucianism in education and court politics, synthesized with the cosmology of scholars such as Dong Zhongshu. This policy endured until the fall of the Qing dynasty in 1911 AD, the Han dynasty was an age of economic prosperity and saw a significant growth of the money economy first established during the Zhou dynasty. The coinage issued by the government mint in 119 BC remained the standard coinage of China until the Tang dynasty. The period saw a number of limited institutional innovations, the Xiongnu, a nomadic steppe confederation, defeated the Han in 200 BC and forced the Han to submit as a de facto inferior partner, but continued their raids on the Han borders. Emperor Wu of Han launched several campaigns against them. The ultimate Han victory in these wars eventually forced the Xiongnu to accept vassal status as Han tributaries, the territories north of Hans borders were quickly overrun by the nomadic Xianbei confederation. Imperial authority was seriously challenged by large Daoist religious societies which instigated the Yellow Turban Rebellion. When Cao Pi, King of Wei, usurped the throne from Emperor Xian, following Liu Bangs victory in the Chu–Han Contention, the resulting Han dynasty was named after the Hanzhong fief. The Zhou dynasty was a Chinese dynasty that followed the Shang dynasty and preceded the Qin dynasty. 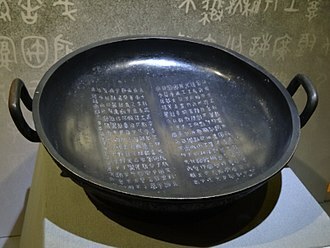 This period of Chinese history produced what many consider the zenith of Chinese bronze-ware making, the dynasty spans the period in which the written script evolved into its almost-modern form with the use of an archaic clerical script that emerged during the late Warring States period. He even received sacrifice as a harvest god, the term Hòujì was probably an hereditary title attached to a lineage. Jus son Liu, led his people to prosperity by restoring agriculture and settling them at a place called Bin, tai led the clan from Bin to Zhou, an area in the Wei River valley of modern-day Qishan County. Taibo and Zhongyong had supposedly fled to the Yangtze delta. Jilis son Wen bribed his way out of imprisonment and moved the Zhou capital to Feng, the Zhou enfeoffed a member of the defeated Shang royal family as the Duke of Song, which was held by descendants of the Shang royal family until its end. This practice was referred to as Two Kings, Three Reverences, according to Nicholas Bodman, the Zhou appear to have spoken a language not basically different in vocabulary and syntax from that of the Shang. A recent study by David McCraw, using lexical statistics, reached the same conclusion, the Zhou emulated extensively Shang cultural practices, perhaps to legitimize their own rule, and became the successors to Shang culture. 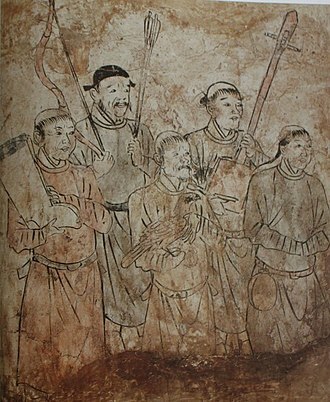 At the same time, the Zhou may have connected to the Xirong, a broadly defined cultural group to the west of the Shang. According to the historian Li Feng, the term Rong during the Western Zhou period was used to designate political and military adversaries rather than cultural. The proto-Zhou were first located in the Shaanxi-Shanxi highland, where they absorbed elements from the Guangshe culture, King Liu moved his people to the lower Fen Valley and to the western bank of the Yellow River, where they resumed agriculture. His son Qing Jie, led the Zhou to the valley of the Jing River. Emperor Taizu of Jin, personal name Aguda, sinicised name Wanyan Min, was the founder and first emperor of the Jurchen-led Jin dynasty, which ruled northern China between the 12th and 13th centuries. He was initially the chieftain of the Wanyan tribe, the most dominant among the Jurchen tribes which were subjects of the Khitan-led Liao dynasty, starting in 1114, Aguda united the Jurchen tribes under his rule and rebelled against the Liao dynasty. A year later, he declared himself emperor and established the Jin dynasty, by the time of his death, the Jin dynasty had conquered most of the Liao dynastys territories and emerged as a major power in northern China. In 1145, he was honoured with the temple name Taizu by his descendant. The name Aguda is transcribed A-ku-ta in Wade-Giles, the alternative, Aguda was the second son of Helibo, the chieftain of the Wanyan tribe. His mother was a daughter of the chieftain of the Nalan tribe and he was born in 1068 near the Ashi River within present-day Harbin, Heilongjiang Province. He was well-known within his tribe for his bravery, and had participated in campaigns against rival Jurchen tribes at the command of the Khitan-led Liao dynasty. In 1109, during the height of a famine, Aguda assisted his father in absorbing famished warriors from other Jurchen tribes to strengthen his own tribe. Later, he fought wars against other Jurchen tribes and succeeded to unify all Jurchens under the Wanyan tribes leadership, in 1113, Aguda succeeded his elder brother, Wuyashu, as the leader of his tribe. Like other Jurchens, Aguda loathed what he considered the exploitation of his tribesmen by corrupt Liao officials, in 1122, when the Liao ruler, Emperor Tianzuo, went on a fishing expedition in Jurchen territory, he ordered all the chieftains to dance for him. Aguda became famous among the Jurchens when he was the person who defied the order. In early 1114, Aguda sent spies into Liao territory and prepared to revolt against the Khitan regime and his chief advisors were Wanyan Zonghan and Wanyan Xiyin. Yue ware with motif, 3rd century CE, Western Jin, Zhejiang. 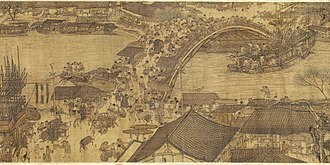 The famous painting Along the River During the Qingming Festival is believed by some to portray life in Kaifeng on Qingming Festival. 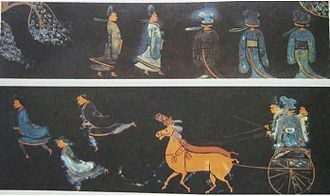 Several versions exist – the above is an 18th-century recreation – of an original attributed to the 12th-century artist Zhang Zeduan. Games in the Jinming Pool, an early 12th-century painting depicting Kaifeng, by Zhang Zeduan. Evening market at the Temple of Supreme Brightness (太清宫 Tàiqīnggōng), an urban temple of the Zhengyi order in Xiguan, Lanzhou, Gansu. 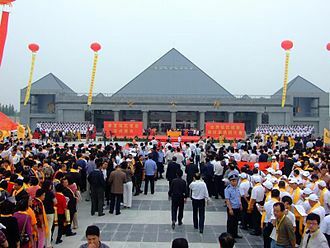 Temple of the Golden Measure (金台观 Jīntáiguan) in Baoji, Shaanxi. A Taoist temple of Mount Longhu, in Jiangxi. 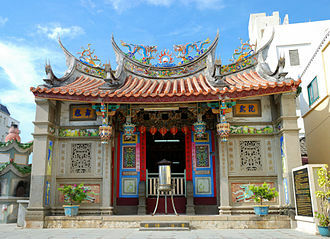 The Temple of the Town God of Wenao, Magong, Taiwan. Temple of Hebo ("River Lord"), the god (Heshen, "River God") of the sacred Yellow River, in Hequ, Xinzhou, Shanxi. Detail of Chinese silk from the 4th century BCE. The characteristic trade of silk through the Silk Road connected various regions from China, India, Central Asia, and the Middle East to Europe and Africa. A view of the Fort St George in 18th-century Madras. 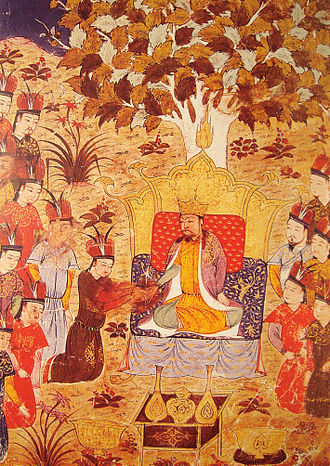 Coronation of Ögedei Khan in 1229 as the successor of Genghis Khan. By Rashid al-Din, early 14th century. 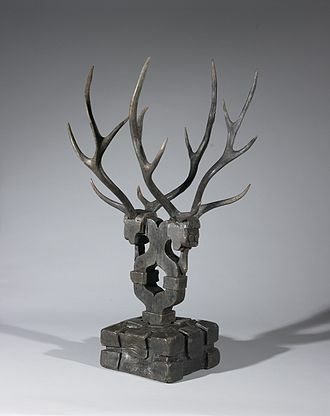 Bronze mould for minting Ban Liang coins, the mould was used during the Warring States period (475-221 BC) by the State of Qin, from an excavation in Qishan County, Baoji, Shaanxi province. Machine-struck cash coins issued under the Guangxu Emperor in Guangzhou, Guangdong. Cash coins minted between 330 BC and 1912 AD. 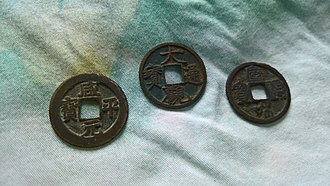 Three different cash coins from the Northern Song dynasty, the first coin reads clockwise while the others read top-bottom-right-left, the first and second coins are written in Regular script while the third coin is written in Seal script. From left to right: Pak Chang-ok, Li Jishen, Kim Tu-bong, Zhu De, Kim Il-sung, Averky Aristov, Pak Chŏng Ae and Choe Yong-gon in 1955. 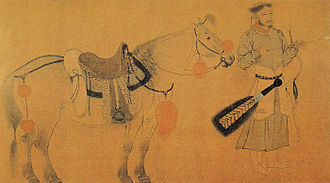 This painting, titled Horse and Archer, is believed to have been painted by Yelü Bei. A stone rubbing of a carved relief from the Han dynasty depicting Jin Ke's assassination attempt on Qin Shi Huang; Jing Ke (left) is held by one of Qin Shi Huang's physicians (left, background). The dagger used in the assassination attempt is seen stuck in the pillar. Qin Shi Huang (right) is seen holding an imperial jade disc. One of his soldiers (far right) rushes to save his emperor. 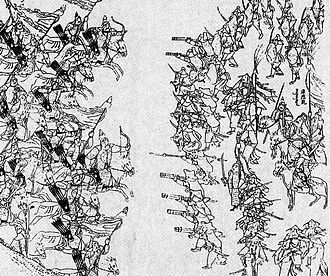 Jurchen cavalry charging Ming infantry in the battle of Sarhu. Stone 'qing' (percussion instrument) from the Erlitou Culture. 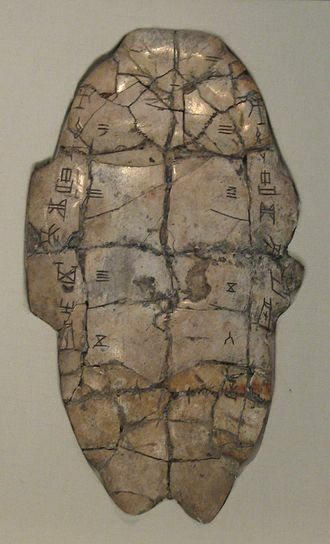 Unearthed at Dongxialeng, Xiaxian, Shanxi Province, 1974. A poster outside a high school in Yangzhou urges people to "speak Putonghua, welcome guests from all parts" and "use civilised language". Chinese pu vessel with interlaced dragon design, Spring and Autumn period.